Mink kits are born with their eyes closed and without fur; they are completely dependent on their mothers for food and warmth. Photo: Truth About Fur. Have you ever visited a mink farm? Are you interested to know more about the care farmed mink receive? 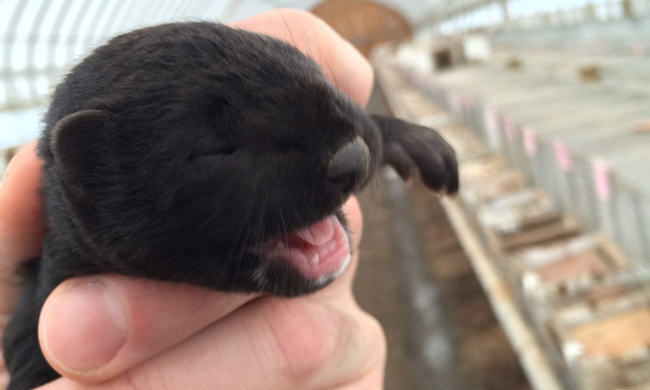 Senior Truth About Fur writer Alan Herscovici asked “Les”, a third-generation Nova Scotia mink farmer, to give us a personal tour and explain the work he does during a typical year. In Part 1: Breeding, Les explained the beginning of the mink production cycle that takes place in Spring. Now we move on to the period April – June and Part 2: Whelping and Weaning. 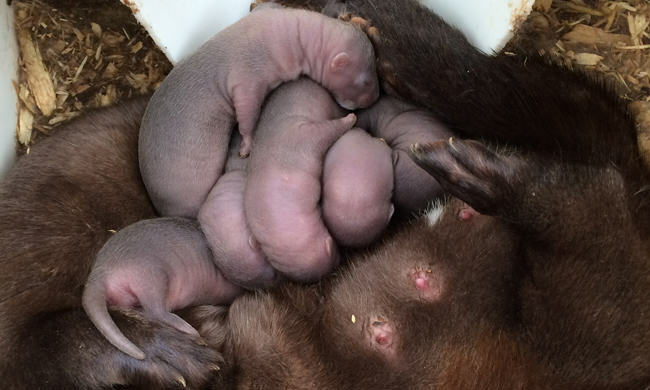 Truth About Fur (TaF): When are the young mink born and what do you do to prepare for them? 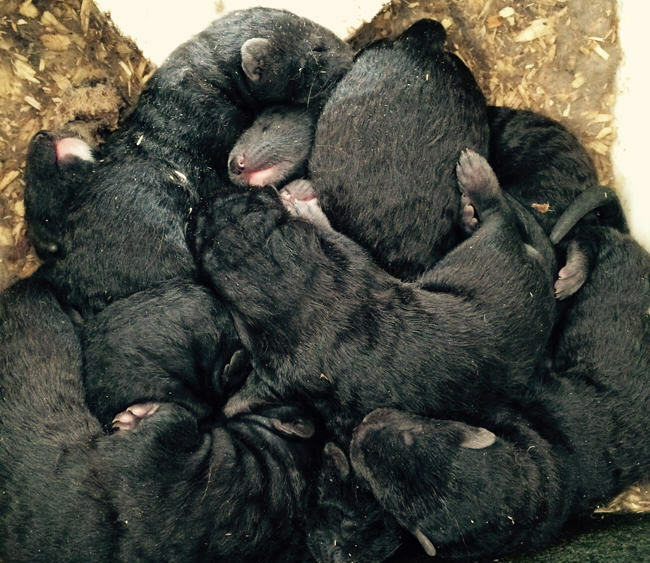 “Les” (Nova Scotia mink farmer): Some of the first litters can come as early as mid-April. Most are born towards the end of April, beginning of May. 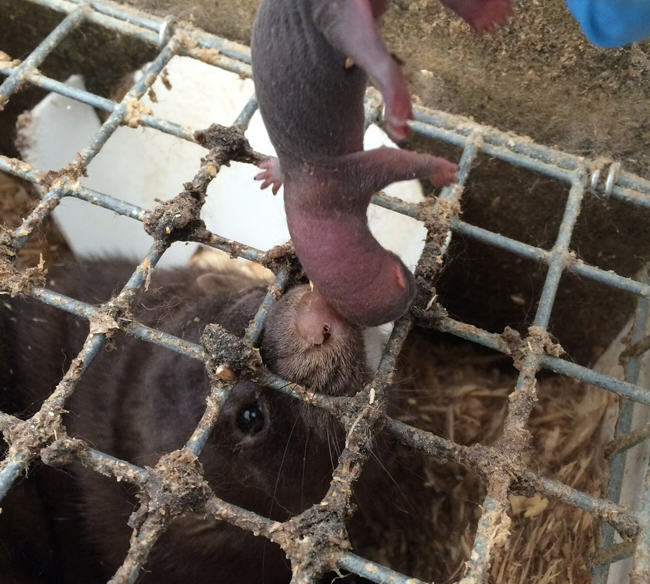 Even before the young are born, however, the mink farmer has plenty of work to do. First we prepare the pens to receive young mink, or “kits”, by covering the regular 1 ½-inch by 1-inch flooring mesh with a ½-inch by 1-inch plastic-coated mesh. This does not allow manure to fall away as easily, but it protects the small kits. We also install a plastic funnel guard at the entrance of the nest box, to keep in the straw or wood shavings that will make a warm nest when the kits are born. We are constantly building up those shavings and forming them into a bowl shape, to keep the kits near the centre of the nest where the mother can nurse them and keep them warm. When you are preparing nest boxes like this for several thousand females, it keeps you pretty busy! TaF: Is there anything special you do when the kits are born? Les: Whelping is one of the busiest times on a mink farm. From first thing in the morning until late at night we are in the barns, checking to see who’s been born, ensuring that their bedding is in a good shape to keep the kits in the centre of the box. We are also watching for any kits that may be born tangled in their umbilical cords. 99% of the time, the moms take good care of things themselves: eating the placentas, cleaning and nursing the babies. But sometimes you will have five babies wound together in the umbilical cords so tightly that the mother can’t free them. We take them to the little surgery section of the barn where we have heat lamps and scalpels. Once we’ve cut them free and cleaned them up, we return them to their mothers. While we’re ensuring that the new-borns are safe, we are also watching the kits born over the past few days, to be sure they are warm enough and nursing well. We are also on the look-out for little ones that are not getting enough milk; perhaps there are too many kits in the litter. You learn to recognize their weak, hungry cries. If necessary, we may move a kit to an adoptive mother with a smaller litter. When litters are too large, the smallest kits may be offered to good mothers with small litters. The kit is first presented to the female at a safe distance. If she sniffs and licks at it, the kit can be placed into the nest box to be raised with her other kits. Photo: Truth About Fur. TaF: Mink will adopt kits from another female? Les: Often they will. You pick a female that is doing a good job caring for a small litter, and hold the tiny, young kit near her. If she snaps at it, you try another female. But if she sniffs and licks it, then you can slowly slide the kit beside her and usually she will care for it with the rest of her litter. TaF: All this sounds like a lot of work with so many young mink. Les: It is! During this whole period we are checking every litter several times each day. Newborn mink kits are tiny. At birth, their eyes are still closed and they have no fur, so they are very prone to hypothermia. In addition to a good bed of shavings, we keep a plywood cover over the nest box for a while, to keep in heat. At about 20 days old, these mink kits now have fur, but still enjoy sleeping close to one another for warmth. Photo: Truth About Fur. TaF: And when are the kits weaned? Les: As the kits get bigger, we remove the plastic shield and move the food and water closer to the nest box. There is also a shelf in the pen area where the female can get away from the kits, to rest herself and encourage her young to fend for themselves. At about one month, they will start licking at the fresh feed we put on the pens every day, and then it’s a few more weeks before they are fully weaned. By mid-June, we can also start removing the small gauge mesh from the floor of the pens, to keep them cleaner. This continues through into late June for the litters born later. It is good that the litters are not all born at the same time; it helps to spread out the work! This mink kit is one month old and a little bigger than most at this age. He’s an “only child” and gets all the milk! Photo: Truth About Fur. TaF: It must be very satisfying to see the kits come out of the nest box and feed themselves. Les: It is, because we have been working very hard to ensure that they make it. It is so strange – insulting really – when some activists claim that we are cruel to our animals, because we work so hard to ensure that they are healthy. We are watching for signs of dehydration, of hypothermia; it takes so much experience and concentration to watch for all the things that can go wrong with young animals. If you don’t love working with animals and caring for them, you probably shouldn’t be a mink farmer! TaF: And how did you become a mink farmer, Les? Les: I am the third generation of mink farmers in my family, and before that there were two more generations who were trappers and early experimenters with breeding mink in captivity. So I guess mink farming is in my genes. I enjoy working with animals, and I enjoy working with mink. It’s a passion, for sure! These mink farmers are awesome people, but then again I may be biased because I grew up next door to some of the farmers. They are a hearty bunch of people who care so passionately for the animals in their care, work such endless hours and are normal healthy people, with a passion for the mink industry. I went to school with some of the owners of the bigger ranches and they are awesome people, kudos to you all. About it being insulting to be accused of cruelty – that is very true. After working a 12+ hour day, you stay a bit late to go the extra mile. Then you come home to news reports of eco-terrorists “freeing” mink to starve in the wild.